Bark for Life has always been a cause close to my heart. My first dog, Mika, was diagnosed with cancer when she was 9 years old. In spite of a hard fight, she lost her battle to hemangiosarcoma 7 months after she collapsed from a ruptured spleen. She was one of the lucky ones. The prognosis is usually pretty grim with a lifespan of 2 - 6 weeks from a diagnosis. We were fortunate to have found a wonderful oncology team at the University of Pennsylvania. I have no doubt it was because of them we had more time together before saying goodbye. 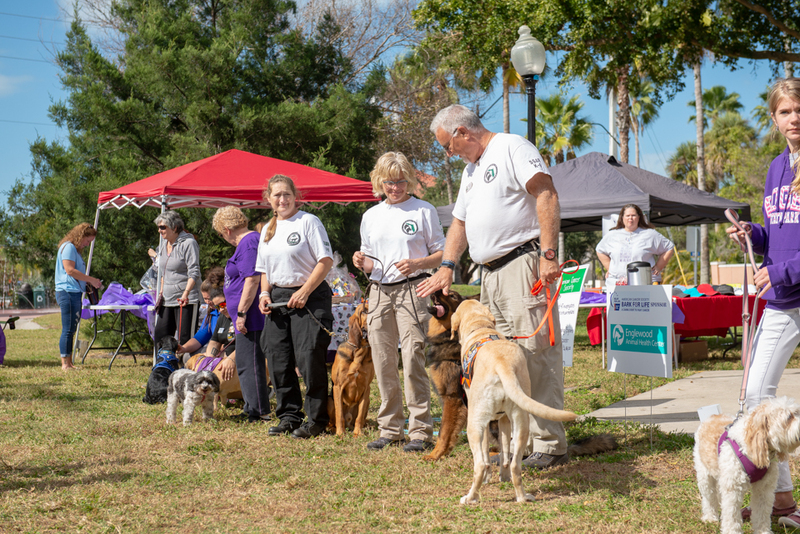 I was one of the vendors at Bark for Life in Venice Florida on Saturday January 12. As always, I had a blast meeting the dogs and networking with other pet businesses in the area. Here are a few of the pooches I met. Sarasota K-9 Search & Rescue did a short demonstration. I learned quite a bit about this group and how the dogs work to find both live and dead bodies in missions all around southwest Florida and beyond. Aries, the 14 month old Rottweiler was a huge hit with everyone. With a face like that, how could you not fall in love?! There was a pet costume contest and this pup was a huge favorite among the crowd! Daisy Mae had the longest eyelashes I’ve ever seen on a dog! Swoon! Bella is one of the Sarasota K-9 Search dogs specializing in locating deceased bodies. She even has her own card to introduce herself to folks like me. How about that? My tent and display of my work. It’s always a work in progress, but at least it gets better each time I attend an event. Dogs and their owners lined up to be judged for best in show and which owner/dog team looks most alike. I don’t remember who won. I’m just glad I wasn’t asked to judge - it would have been hard to pick just one winner!